I am reading through the Dover publication of Gauss' work on curves and curved surfaces called "General Investigations of Curved Surfaces". This Dover publication presents two major papers authored by Gauss in 1827 and 1825 (the 1825 paper was actually published later than the 1827 paper). The subject matter is not much different than taught in a typical Advanced Calculus class that presents the beginnings of Differential Geometry. However, the book is still interesting reading although a tough travel due to the more crude notation and the total lack of any diagrams. This whole topic was made for the use of graphic diagrams to help with the presentation and yet nothing of that sort appears in the entire book. The only diagrams that appear are in the end notes that briefly introduce the reader to Spherical Geometry. These end notes are not part of Gauss' original work. I submit that this whole paper could be condensed by half or maybe to a third of its current size by the use of well appointed diagrams to help illustrate the mathematical development. Indeed, reading through this is like reading a thousand words instead of the one well placed "picture". And, the very first section (aka paragraph) could be replaced with a diagram of the Unit Sphere with radial vectors displayed to denote points (x,y,z) on the surface of the sphere. Which brings me to my question. Obviously these writers did not have LaTeX and TikZ at their disposal for writing and the idea of printing papers with diagrams was likely difficult, costly, or maybe impossible (without hiring an artist) in those earlier years. At what point did diagrams become more prevalent in published papers. I am referring of course to papers where a diagram is well suited to illustrating the concepts being described. For the papers contained in this Dover book, I would guess almost every section could be augmented by a diagram. I am guessing not before 1900 and maybe even later did diagrams become more common. I am probably older than most of the readers of this forum but my textbooks (physics & math) were loaded with diagrams (mid-1960 but many textbooks published in mid to late 1950s) and this was before Knuth, TeX, and of course, TikZ. Probably not what you are really asking. But it seems interesting anyway. 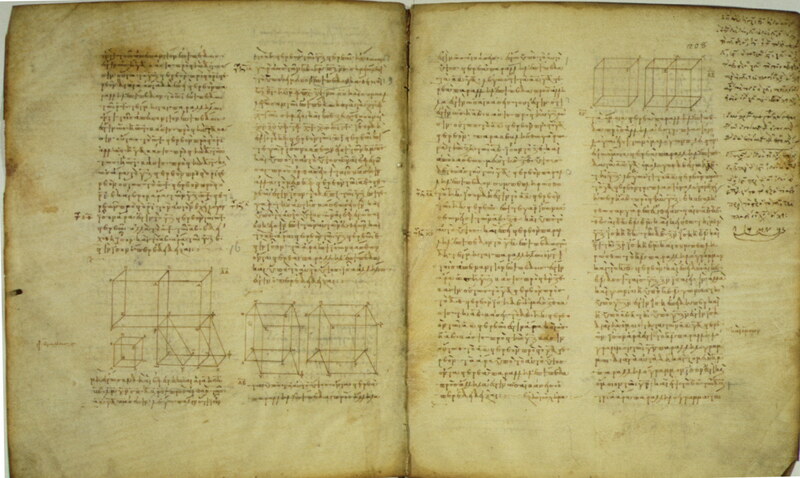 This page of Euclid is from the Ninth Century. There is a diagram. It has other modern innovations, such as spaces between words. 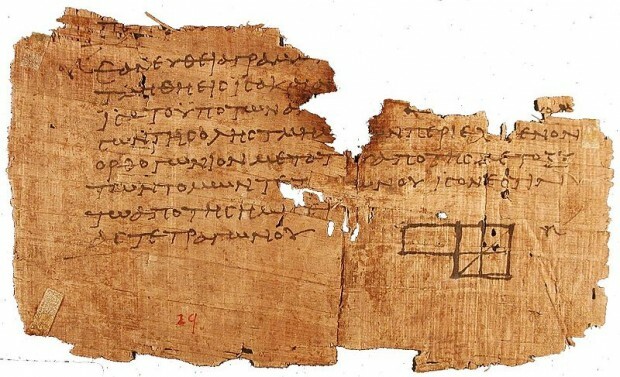 The papyrus fragment below (also Euclid) is from the First Century, one of the earliest known instances of a geometric diagram. A parchment from the Ninth Century with a diagram representing three dimensions. Something that has not been underlined enough is the technical limitations of the time. From early 18th century, and in particular at the time of Gauss, copper engraving was dominant. This process is time-consuming, costly, and last but not least, necessitates a very able "artist" (figures carved on wood can be found in mathematical texts till the early 18th, but this technique hadn't the precision that can be obtained with copper). For this reason, when figures were present in a book, they were generally gathered at the end of the book. Many new imaging processes were invented, mainly in the second half of the 19th century, under the influence of the huge development of massive (newspaper) printing techniques, lithography, photoengraving, offset printing etc... providing mathematical treatises or textbooks with very good overall quality (printing, binding, ...) and especially good figures inserted in the text at affordable prices everywhere in the 1900s. I'm not a specialist in history of science and math but I have recently read something about your question accidentely in the book by MacLane "Categories for the Working Mathematicians" in the Notes to the Chapter I. Not the answer you're looking for? Browse other questions tagged mathematics publishing or ask your own question. How was Newton's classification of cubic curves completed? Why did 92% of cases of simultaneous discovery in the 17th century end in dispute? Who blocked publication of “Mathematics in USSR. 1958-1967”? What is the modern understanding of the chronology of Newton's mathematical work? How did the publication feat of Einstein's four 1905 Annus Mirabilis papers get through peer review? Was further research done about the invention of Algebra?